Blockchain buzz has reached deafening levels, and its proponents say we haven’t heard anything yet. The blockchain-enabled transformations they describe make the Internet revolution look almost trivial. Critics argue that too many people drank the blockchain Kool-Aid. Outside the cryptocurrency arena, they say that blockchain amounts to little more than some really slick slideware. The reality lies somewhere in between. However, some pilot implementations in a range of industries are starting to materialize from the clouds of hype. And Estonia is establishing itself as a “Blockchain Nation,” making an all-in commitment to blockchain-based digitalization of just about everything. • Intel formed a blockchain business unit and announced key partnerships. • IBM is showcasing customers that are applying blockchain to real business problems. • Oracle—famous for holding off on new technology until customers are ready to start buying—has jumped into the blockchain fray. No one expects to see any full-scale, production blockchain implementations in the next 12 to 18 months. The consensus—including a major blockchain report issued by Gartner in July—is that it will take 5 to 10 years, depending on the industry, with the manufacturing/supply chain area likely to lead the charge. Whatever the timeframe, one thing is certain—blockchain is a resource-intensive technology. Blockchain technology experts have done a brilliant job using software to grease the skids, but any degree of success blockchain achieves is still going to take a lot of silicon. Definitions keep evolving, but a blockchain is basically a distributed database—specifically, a “distributed ledger”—managed by computers in a peer-to-peer network. This distributed ledger contains an “immutable” record of all transactional data. Each computer in the peer-to-peer network maintains a copy of the ledger, and all copies get updated and validated simultaneously. There is no single point of failure. The first block in a ledger has a header and data relating to transactions that take place in a set time period. The block’s timestamp is used to generate a hash, and then each subsequent block in the chain employs the previous block’s hash to calculate its own. 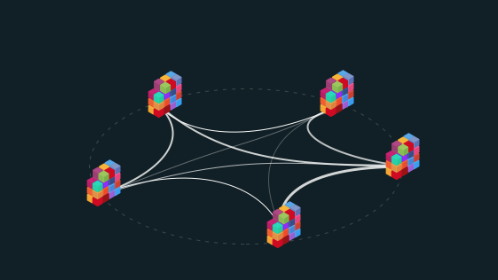 Before one of the peer computers can add a new block to the chain, its authenticity must be validated by a computational consensus process. A majority of the peers must agree that the new block’s hash is correct. Once blocks have been added, they cannot be changed. Attempted alterations will change the hashes for the previous and subsequent blocks, disrupting the ledger’s shared state. When that happens, no new blocks are added until the problem is fixed—usually by discarding the problem block and repeating the consensus process. Blockchain pushes the Internet’s disintermediation effect into a whole new dimension. The Internet let everyone publish and exchange information without going through the traditional information gatekeepers. Blockchain lets us exchange valuable assets with one another, instantly and anonymously, and without going through a trust intermediary. The blockchain process itself creates the trust that used to be supplied by banks, lawyers, real estate brokers, and other trust agents. Researchers at Bell Laboratories formulated the basic blockchain concept in a series of papers in the early 1990s. Then in 2008, Satoshi Nakamoto published “Bitcoin: A Peer-to-Peer Electronic Cash System,” which used the first distributed blockchain to solve the double-spend problem that had plagued digital currencies. Launched as the bitcoin open source cryptocurrency in 2009, it became a real-world blockchain proof of concept. Whatever the issues surrounding cryptocurrencies, their underlying blockchain networks have a remarkable record. Distributed ledgers thus can be bullet-proof, but at a price. The consensus workload causes major scalability issues as the network grows, and a public distributed ledger raises concerns about transaction privacy and data ownership. But there is clear upside in fixing these problems, too. “The ability to achieve consensus with blockchain, especially in situations where participants have no history working together, opens up a range of potential markets and applications,” said Steven Woo, vice president of systems and solutions and distringuished inventor in Rambus‘ Office of the CTO. “Nascent markets and applications, which don’t have a lot of historical infrastructure to replace or be compatible with, are good candidates for the technology, as well as applications and markets that want to reduce management costs and improve the speed of commerce. By eliminating the need for a third party to administer the ledger and clear transactions, participants using blockchain technology can reduce costs and potentially increase the speed at which they do business. Eager cryptocurrency miners quickly discovered that the GPU chips made by AMD and NVIDIA were much better at blockchain hash computations than standard CPUs. They contain a lot more arithmetic/logic units, and these particular arithmetic logic units (ALUs) happen to be well suited to the repetitive tasks of the bitcoin mining process. No such plans have been announced by AMD or NVIDIA, although both acknowledge a nice bump their GPU sales from cryptocurrency miner demand. AMD sees much bigger blockchain opportunities beyond the cryptocurrency space. AMD brings a uniquely comprehensive portfolio of technologies to the blockchain table—CPUs, GPUs and APUs, all shipping with AMD’s platform security processor built in. Only AMD “can create both x86 CPUs and GPUs, both of which have a role to play as blockchain applications look to optimize around serial or parallel computing capabilities,” said Roskowitz. One of blockchain’s biggest challenges out of the gate was scalability. How do you make consensus broadly available to enterprise blockchains without consuming the kind of power bitcoin needs? Intel came up with PoET (proof of elapsed time), an algorithm that works with SGX to enable a lottery-style consensus requiring little or no power. Supply chains would be a good fit for blockchains that use lottery-style consensus, Reed added. 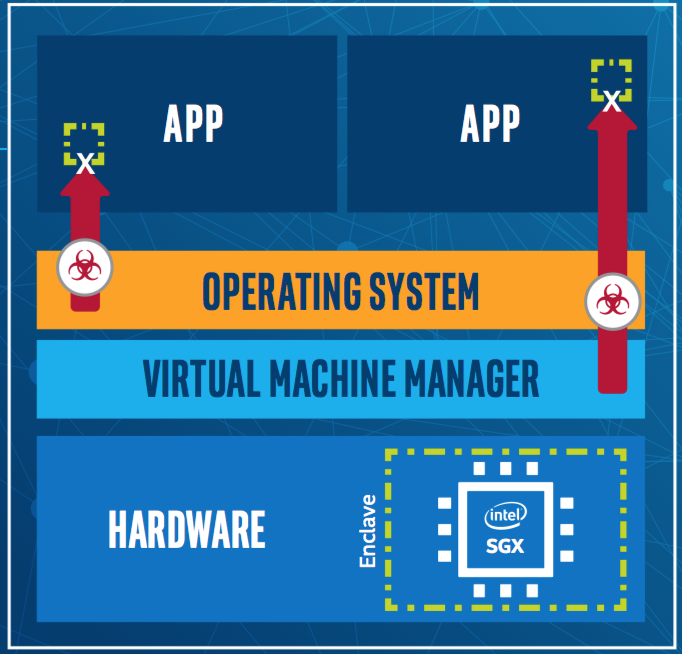 Throughput is another blockchain scalability issue Intel is addressing with SGX, in conjunction with Microsoft’s Coco (confidential-consortium) Framework for enterprise blockchain networks. Coco Framework can use SGX as a Trusted Execution Environment enclave that protects the consensus process. Now the blockchain can commit a block without a second validation pass—a shortcut that boosts throughput to 1,600 transactions per second, which is approaching database speed. SGX also is being used to enable transaction privacy in enterprise/consortium blockchains. A supply chain blockchain, for example, would include competitors who shouldn’t be able to browse each other’s historical transactions. To prevent this, data is stored in the blockchain ledger in encrypted form, and decrypted only in SGX. Inspired in part by computer games technology, R3 is using SGX to enhance privacy on its Corda distributed ledger platform for financial services. You can send data to the computer of someone at another company, where it gets processed in the SGX enclave. The owner of the receiving computer gets the result of the processing, but can’t see or otherwise use the data itself. A remote attestation process ensures that the data landed in the right place. Each SGX-equipped chip contains a unique, factory-installed cryptographic key. The receiving enclave creates a checksum against the binary data, and then uses Intel’s attestation service to get a signature from Intel’s master key. This chain of custody from the SGX chip to the Intel factory can verify what the enclave is doing at any time. Blockchain purists say this sets Intel up as a trust intermediary, which violates one of the basic blockchain tenets. Others say it is a step in the right direction, replacing the very bulky, slow, labor-intensive processes of trust organizations with a digital intermediary that is virtually frictionless. To move blockchain much beyond the cryptocurrency space, developers of business applications need better tools. Smart contracts have proven particularly tricky, and the native SGX environment is a case in point. Designed for the x86 architecture, the SGX enclave supports only C and C++ programming languages, which developers in a lot of industries haven’t used for many years, or never learned at all. Additionally, the enclave has no operating system or access to resources of the host computer. This is a problem for business applications developers, who are domain experts at meeting the needs of specific industries. They don’t typically deal with bare-bones computer technologies. R3 solved this problem by taking an open-source Java virtual machine and fusing it with a tiny operating system that provides basic services. Once this JVM subset is loaded into the SGX enclave, run-of-the-mill Java developers can use it to write flows that inform smart contracts. R3 initially is focusing on financial services with its SGX-enhanced Corda distributed ledger platform, and expects to start commercial product releases this quarter. Financial-services companies have already completed proof-of-concept projects on R3’s test network, reports Charley Cooper, head of external affairs for R3. Much of this is still experimental. Overstock.com—which started accepting bitcoin payments for its merchandise in January 2014—has scored some blockchain firsts with its tZERO subsidiary. These real-world blockchain PoCs include an SEC-compliant Alternative Trading System (ATS) that trades securities in the form of cryptographic tokens; a private blockchain bond offering; and public issuance of a blockchain security. Overstock.com has announced it will use the new ATS this month for its own initial coin offering. The ICO is expected to fund more Overstock.com investment in blockchain-related technologies. Globally, cryptocurrency and blockchain startups in 2017 have raised more money through ICOs than from early-stage venture capital funds. Some traditional financial-trust intermediaries also are embracing blockchain in a big way. According to CoinDesk, Bank of America, the second-largest U.S. bank, has filed more than 30 blockchain patent applications. Bank of America is also an R3 investor. All of these cryptocurrency and cryptocurrency-adjacent examples are seen as the mere tip of the blockchain iceberg. Real-world pilots and pilots have been popping up elsewhere in recent months. Walmart completed two successful blockchain food-safety pilots, using IBM’s Hyperledger Fabric — an open-source blockchain hosted by The Linux Foundation to which IBM contributes – to trace Chinese pork and Mexican mangos from their origin to store shelves. Such a capability could potentially streamline investigations into food-borne illnesses from weeks to seconds. Impressed with the results, nine other food giants have joined Walmart and IBM in a blockchain coalition for the food supply chain. Now they have to convince their suppliers to board the blockchain train. Logistics technology specialist Marine Transport International in August announced the successful pilot of Container Streams, which connects supplier, shipper, customs and terminal entities on a blockchain ledger. Automated data flows integrate a wide variety of data sources, including legacy systems. Scientists at the University of Copenhagen validated the MTI project and concluded that the logistics industry “can expect better visibility, connectivity and cost savings as a result of distributed ledger adoption.” First, though, the logistics industry—like the food company coalition—needs to get all the players in the logistics chain to participate. Insurance giant AIG used IBM’s Hyperledger Fabric to demonstrate a smart-contract-based insurance policy. The test involved a master policy written by London-based Standard Chartered Bank and used to issue policies in the United States, Singapore and Kenya, where different local regulations apply. A smart contract provided a shared, real-time view of policy data and documentation, and delivered automated notifications of payment events. Third parties—brokers, auditors and other stakeholders—could participate and get customized views of relevant information. AIG concluded that blockchain technology can reduce friction and create a new level of trust and transparency in the underwriting process. Blockchain technology also has been proposed as a solution to the counterfeiting that plagues supply chains. Counterfeiting is basically a double-spend problem—the very problem the initial bitcoin blockchain was designed to eliminate. The Semiconductor Industry Association estimates that semiconductor manufacturers lose $7.5 billion in revenue to counterfeiting each year. A study last year by the OECD found that counterfeit and pirated goods accounted for $461 billion in worldwide trade. That’s about 2.5% of global GDP, and it doesn’t include untold additional costs from the threats counterfeits may pose to the health, safety and security of the recipients. Chronicled, a San Francisco-based blockchain startup, recently completed a pilot demonstrating a cryptographically secure method for anonymously transferring the identity of physical assets as they move through multiparty supply chains. Each item has a unique Serialized Global Trade Item Number. This SGTIN identifies the item as it moves through the supply chain, and it can only be in one place. If a duplicate shows up, the blockchain network is alerted to the existence and location of a counterfeit. The Chronicled pilot involved the pharmaceutical industry, which is under a federal mandate to provide end-to-end tracking of drugs by 2023. However, such a solution could just as readily be applied to semiconductors. Initially, it seemed that using unique identifiers on blockchain to provide individual tracking of high-volume items with relative low value simply wasn’t practical. However, “state channel” Raiden technology recently demonstrated on the Ethereum network could potentially make the cost of individual registering each chip insignificant. Basically, certain types of transactions are moved into off-chain state channels where they are processed, freeing up the blockchain for its primary role as a distributed ledger. “This could enable you do to billions of transactions for pennies,” said D-Node’s Bailey. Similarly, a recently proposed Plasma framework proposes a way to offload a lot of blockchain processing. Described as “a chain within a chain,” Plasma is a series of smart contracts that run on top of a parent chain and focuses on the enforcement and settlement of batch transactions. Plasma should enable Ethereum blockchains to process smart contracts and transactions for a lot less, and accommodate much larger applications. At the same time, as with Raiden, transactions per second should move into the stratosphere. And with costs dropping, the outlook is very positive. Still, critics contend that hype is driving people to approach blockchain in the wrong direction. “They are trying to fit businesses to blockchain instead of the other way around, and they are doing it trivially,” said Naveed Sherwani, CEO of SiFive. The solution is 90% business problem and 10% blockchain technology, and people think it’s the reverse. A lot of people in the business world get all excited about blockchain, but don’t really know what it is. Conversely, the technology people who do really understand blockchain lack specific knowledge of business applications. These two groups are sustained by the hype, and—if Gartner’s projections of the blockchain hype cycle are correct—they are about come down to earth with a thud. “They are like Amazon in the early days of the commercial Internet,” said Sherwani. While people with grandiose ideas crashed and burned, Amazon tackled one small problem, figured it out, and built on it. That’s how blockchain is likely to happen. Meanwhile, business developers often find that the practicalities of dealing with blockchain technologies—particularly smart contracts—are making any real application development virtually impossible. Blockchain is still very nascent and rudimentary, and its enthusiasts are trying to rush the process. They don’t notice the big gap between the blockchain infrastructure and the applications that are being planned. Business culture issues are also creating problems—more so than in previous technology disruptions. Companies must make fundamental changes at the cultural level, which can be a lot harder than changing business processes. To really understand blockchain, the bona fide experts seem to be saying, you can’t just think outside the box. You have to take a leap of faith and leave the box altogether, and trust that you aren’t stepping into the void. The good news is that businesses have started doing real things with blockchain. “We’ve proven the technology, and now we have to get the culture to come along with it,” said Ed Featherston, vice president and principal architect at Cloud Technology Partners. He and many others expect the next 12 to 18 months to tell the tale. Blockchain could still fizzle, they acknowledge, but the progress they are seeing—plus the enormous amounts of money being invested—make that unlikely. The top candidates for the first big blockchain implementations include the manufacturing, supply chain and logistics sectors. Financial services seem likely, too, if regulatory issues and risk aversion don’t hold them back. These are all businesses that would benefit greatly from what blockchain does best: provide automated, bullet-proof audit trails. The focus is squarely on the enterprise market as blockchain applications expand beyond the cryptocurrency space. However, the home market also presents some interesting and potentially huge opportunities for the semiconductor industry. IBM’s IoT group has an interesting vision of computing at the edge—truly distributed computing that contrasts somewhat with the prevailing cloud trend. Blockchain and IoT technologies have particularly big synergies, said Christian Catalini, assistant professor of technological innovation, entrepreneurship and strategic management at MIT’s Sloan School of Management. “A blockchain can drastically lower the cost of verification,” Catalini said. “This makes IoT devices and sensors a useful complement to blockchain.” The IoT devices serve as a key bridge, grabbing information from the analog world and porting it into the digital universe. A blockchain application can track a smart device and maintain its pedigree—where it originated and who it went through. Blockchain-based smart contracts can be used to determine which IoT devices talk to each other, without having to go back to a central authority for permission. If the typical residence is going to be a smart home with IoT devices and sensors all over the place, will this home ultimately need a CPU to process all this data? An appliance vendor might benefit from having a computer it could actually query as it monitors the dishwasher, for example. And consider the Amazon Echo—it wouldn’t take much to hook the device up to a terabyte drive that captures all the sensor data the home is generating. All this dovetails nicely with personal data being elevated to an official asset category by the World Economic Forum in 2011, Hardjono points out. There will doubtless be ways people can turn all that data into gold. Clearly, blockchain-related opportunities abound, although many remain to be defined. With startups and cryptocurrency warriors working on blockchain implementations from the bottom up, and technology giants, enterprises and even governments trying to impose blockchain from the top down, it’s not clear who will win. Supply chain becomes central focus as more processors and memories are added into devices. Susan Breidenbach is a contributing editor at Semiconductor Engineering. This column gets close! Thank you. Simply wish to say your article is as surprising. The clarity in your post is simply spectacular and i can assume you are an expert on this subject. Well with your permission let me to grab your feed to keep updated with forthcoming post. Thanks a million and please carry on the gratifying work.